I'm a rising senior who spends his spare time fighting crime on the streets. I also enjoy volunteering in the community and running recreationally. I plan to go to college to double major in mathematics and computer science, hopefully with an emphasis in number theory. I am a native New Englander, originally from Bedford, Massachusetts, but have been living in Colorado for the last six years. 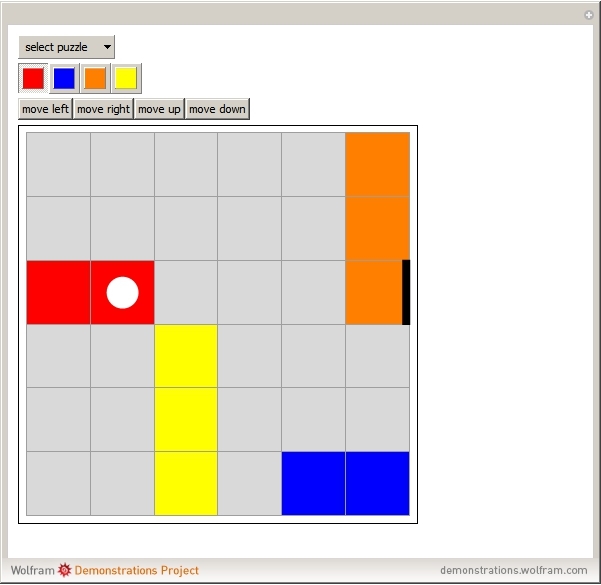 The goal of this game is to manipulate the blocks, or cars, in such a way that the red one is able to reach the end of its row. Objects can only be moved within their rows or columns, one space at a time. There are ten different puzzles for you to enjoy.